This new generation Rail Brazing is able to minimize heat up affection to rail. This metallic brazing method is able to prevent interruption of conducting current caused by rusty trouble at rail top surface. Rail quality belongs to carbon steel is not stable against heating. 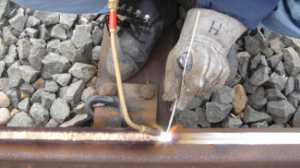 This silver alloy brazing method is workable to any kind of rail quality because it is possible to minimize heat affection to rail. We do our best to expand application of rail brazing method after studying more safety factor and more economically method in order to offer our suggestion to customers.